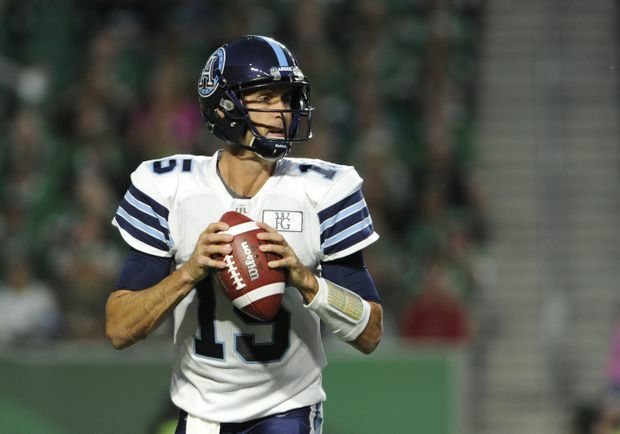 The Toronto Argonauts are waiting to hear from quarterback Ricky Ray on whether the 39-year-old wants to resume his CFL career in 2019. Toronto Argonauts GM Jim Popp continues to wait on Ricky Ray. Popp said Friday night Ray still hasn’t informed the CFL club about his football future. The 39-year-old quarterback suffered a season-ending neck injury in a 41-7 home loss to the Calgary Stampeders on June 23. Popp said he last spoke with Ray in late January prior to the start of CFL free agency Feb. 12 and nothing was decided on whether Ray would embark on a 17th season in Canada. Following Toronto’s 4-14 season, Ray said for the second straight year he’d have to think long and hard on his football future. After the ’16 campaign, Ray opted to return to the Argos and flourished under then head coach Marc Trestman. He started 17 games and passed for 5,546 yards with 28 TDs and 11 interceptions in leading Toronto to a Grey Cup title, Ray’s CFL record fourth as a starter. But last season, Toronto never recovered from the loss of Ray, losing nine of its final 10 regular-season games. Popp went hard after Calgary starter Bo Levi Mitchell to open free agency before the star quarterback opted to remain with the Stampeders. The Argos have installed James Franklin, Ray’s backup last season, as their starter. After losing out on Mitchell, Popp said the Argos were looking for a veteran quarterback who could still not only play but also serve as a mentor for the 27-year-old Franklin. He mentioned longtime B.C. Lions pivot Travis Lulay as someone who could fill that role but Lulay announced his retirement last week. The club opted to sign Canadian QB Brandon Bridge, 26, to a one-year deal. Popp did say there’d definitely be a role for Ray, who became a free agent in February and remains unsigned, with the Argos if he decides he wants to continue playing. “I think we’d have to discuss what that role is,” he said. “If he were to play or continue playing then I think he’d be open for about anything we’d have a discussion with. And Popp said he’s certainly leaving the door open to Ray resuming his career with Toronto if that’s what he wants. “We’d love to have him back,” Popp said. “He’s just a tremendous, respected person in the room not just as a person but as a leader when he is on the field. He’d be tremendous help and teacher to anybody if he were playing a different role but it’s all hypothetical. Popp said Ray’s silence suggests he’s still grappling with the decision.